I've driven by this place a dozen times, and I've told myself repeatedly that I'd eat there one of these days. Six years later, it finally happened! Honestly, I don't know how I let that much time pass before I actually made my way over to eat dinner in this charming little establishment. I mean, it's no secret that I enjoy going out to eat. (I'm always sharing my food with you, it seems.) However, this place can't be compared to the typical dining experiences I frequently have. It's different because you feel like you're having dinner in someone's house, not a restaurant. The atmosphere is cozy and intimate, and has very limited seating for service. Reservations are required in order to dine, otherwise, they wouldn't make enough food. You see, they operate differently than restaurants you have become accustomed to. The meals are prepared fresh and made with organic ingredients that are oftentimes locally sourced. That is, if they didn't grow some of the items themselves. Across the street from the inn are a large number of raised bed gardens where they can pluck ingredients to use that same day. They also put a big emphasis on local items included on the menu; It is something I definitely appreciate. The menu changes every night depending upon what they get their hands on. Surprises were plentiful that evening! I can't even tell you how giddy I was to be there. It was undoubtedly the best part of my birthday weekend. You know, because of the FOOD! I'll just stop beating around the bush here, and tell you about the amazing meal. 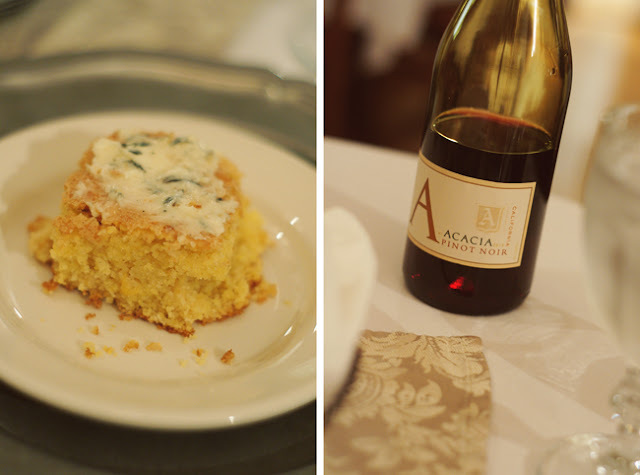 The dinner began with a basket of homemade white and corny corn bread. They supplied us with a dish of their very flavorful herb butter, which I slathered on top of my cornbread. There was a slightly sweet crust on top that paired so well with the buttery spread. Next up, was the petite vegetable soup which was simple yet satisfying. For the third course, we were served a mixed green salad topped with local goat cheese, dried cranberries & blueberries, pecans, and a molasses vinaigrette. I devoured this salad even though the dressing wasn't as sweet as I would have wanted it to be. I will say, though, that it was quite interesting. Our main dish consisted of beef bourguignon smothered with a rich red burgundy wine sauce topped with mushrooms and pearl onions. The beef was tender and delicious. No knife required for cutting. The accompanying sides included creamy grits and sauteed green beans. I loved the grits. They were awesome! At this point in the meal, I barely had enough room to finish the beef bourguignon ( I ended up taking a portion home) much less leave enough room for dessert. But I'd be crazy to pass up the last course, don't you think?! I ended up going with the chocolate fudge cake (it was called something like that—sorry, I don't have my notes!) that came with homemade caramel ice cream. I could only have one tiny corner of the cake and a few spoonfuls of the ice cream, but oh my word, they were both incredible. The leftover cake went home with me, too! By the end of our dinner, we had been there for over 2 hours. Tell me, when do you get the opportunity to take your time eating a multiple-course meal like that? Not very often, I'm sure. I know that I'm used to things coming as quickly as possible when dining out, so this was a welcomed alternative because I don't like feeling rushed. 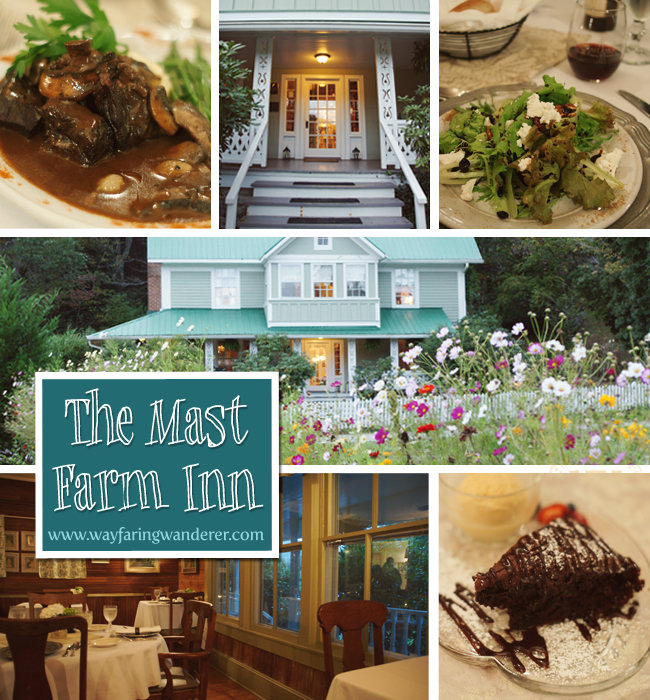 If you'd like to find out more about The Mast Farm Inn, here is a link to their website. Having dinner at The Mast Farm Inn's restaurant (called Simplicity) was a treat, although I don't think this should just be one of those “special occasion” places to eat. Yes, it was slightly pricier that your typical restaurant. However, for the quality of food, service, and ambiance, it was well worth the expense. Now that I've finally been there for a dinner service, I know that I'll be back a lot sooner next time! WHICH PART OF THE MEAL SOUNDS THE BEST TO YOU? Please share in the comments! Or on the WW Facebook page! I have always felt that its not just food that makes the experience but the setting as well.. I find this place very interesting and refreshing at the same time.. very rare to find a place so in tune with whats important when it comes to dining out. The fresh food, the intimate setting, I will definetly have to try this place when I am in the area.. sounds very romantic and yummy!!! That cake looks super yummy! Yey for birthday surprises! The place looks so adorable...and I really like that the vibe of the decorations and everything totally seems to go with the menu -- local food, homey deco. Very cool! Excellent line up. We'll be linking to this fantastic report on our internet site. Sustain the nice producing.